Before we can begin, your dog has to let you open his mouth and hopefully learn to look forward to his dog dental care sessions. Start training your dog to get accustomed to you handling his mouth, teeth and gums. First dip your fingers in something tasty (such as peanut butter or chicken broth) and let him lick it off your fingers. As he gradually gets used to this, you can progressively move into letting him put your fingers into his mouth, eventually rubbing his gums and teeth. After a few training sessions, your dog should actually begin enjoying this activity! And while it is always good to start early when training your dog, senior dogs can still learn new tricks! It’s always important to have the right tools for the job and dog dental care is no different in this regard. Use a toothbrush designed especially for dogs instead of human toothbrushes. Dog toothbrushes come in different sizes with angled handles so you can easily reach inside his mouth to brush. There are also small finger brushes that fit over the tip of your finger, which many people find easier to use to brush their dog’s teeth. No matter what type of toothbrush you use, it is important to be gentle and go slowly, especially when you are first learning how to brush your dog’s teeth. Use dog toothpaste instead of human toothpaste – human toothpaste is not meant to be swallowed and can easily upset your dog’s stomach. Dog toothpaste comes in a variety of flavors like beef or chicken, so once your dog realizes the toothpaste really does taste good, he’ll look forward to these dental hygiene sessions. Many vet hospitals that provide dog dental care are participating with specials this month in celebration of Pet Dental Health Month, so contact them about where to find canine tooth brushing kits. This really depends on the condition of your dog’s teeth and gums. Ideally, you should brush your dog’s teeth at least once a week. If your dog is more prone to developing plaque, then you should brush his teeth twice a week. And for dogs with periodontal issues, you should brush his teeth daily (make sure to follow the advice of your vet). Once a week, check your dog’s breath. 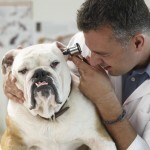 If his breath has a foul, offensive odor, it’s a good idea to take him to your vet for a checkup. Another part of home checkup is to lift his lips and examine his gums and teeth. The gums should be pink, not white or red and his teeth should be clean, without any brownish tartar. Take a closer look and see if there is any swelling of the gums, visible cysts or any loose teeth. Your vet is the expert on dog dental care and may recommend having your dog’s teeth professionally cleaned, and most likely will use anesthesia for the cleaning. Your vet will then be able to fully assess your dog’s oral health, check bone level around the teeth, scrape the build-up of plaque from the gum line areas, and polish the teeth for a sparkling finish. Your vet will also be able to determine a tooth’s periodontal disease status and what treatment beyond cleaning is necessary. Along with regular tooth brushing and regular dental visits, you can also help prevent dental problems by providing your dog with crunchy kibble and firm chew toys to help reduce plaque and tarter. Also try our product Breath-A-Chews, which is a chewable tablet made with all natural ingredients including mint and chlorophyll. So remember bacteria and plaque caused by food can cause build-up on your dog’s teeth, which can then harden into tartar, possibly cause gingivitis, receding gums and even tooth loss. You can fight off these dental problems with regular dog dental care! Halitosis (bad breath in dogs) – can be the first sign of a mouth problem and is caused by bacteria growing from food particles caught between the teeth or by gum infection; regular tooth-brushings can help prevent this. Gingivitis – inflammation of the gums usually caused by plaque, tartar and bacteria above and below the gum line. Symptoms include red, swollen gums, possible bleeding and bad breath. See your vet for teeth cleaning and oral examination. Periodontal disease – a painful infection between the tooth and gum that can result in tooth loss and potentially spread infection to the rest of the body. Signs are loose teeth, bad breath, tooth pain, sneezing and nasal discharge. See your vet for cleaning and oral exam. Swollen gums – develops when tartar builds up and food gets stuck between the teeth. Regularly brushing your dog’s teeth at home and getting annual cleanings at the vet can prevent tartar and gingivitis. Tooth fractures – can occur when dogs chew hard substances such as rocks or hard chew toys.